Ever bought a game that ties into one of your favorite fantasy, scifi, or comic book tales, only to play it and find out it is total crap? Unfortunately, licensed games are historically bad, leaving a lot of fans in this same situation. You probably already know about 1982's E.T. The Extra-Terrestrial and 1999's Superman 64, so these two stinkers are omitted. Here are eight more of the absolute worst ones. The defunct video game publisher LJN loved one thing - green paper. Almost all of their video games revolved around existing properties, with 1988's Uncanny X-Men one of their most awaited projects to date. Uncanny X-Men allowed players to take on the roles of several different X-Men – Wolverine, Nightcrawler, Storm, Colossus, Cyclops, and Iceman, an idea unheard of in the early days of console gaming. Once popped into the NES, the game faltered on nearly every level, with the game flaunting unnecessarily difficult gameplay and programming errors . Where LJN's Uncanny X-Men gained the ire of many a fan is the nigh impossible final level, a level which required the player to input a series of commands written on the outside of the cartridge itself to proceed. Running high on the adrenaline rush of the end of Game of Thrones Season Two, Atlus released Game of Thrones for the PS3 and Xbox 360 in May of 2012. The Action RPG features voices from two supporting characters from the HBO series, Lord Commander Jeor Mormont (James Cosmo) and Lord Varys (Conleth Hill), along with a brief vocal cameo by George R.R. Martin. The installment in the franchise started the player off a member Night's Watch, but presentation is murky, with the graphics looking like something out of a prior generation of game. The controls and combat are difficult, leaving little for the game to stand on other than story. Sadly, the game falls short and comes off as little more as licensed cash grab. The Shadowrun series is responsible for two of the great unheralded classics of early 1990s gaming – a set of completely different games for the Super Nintendo and Sega Genesis that expertly mixed the Shadowrun pen and paper role playing game franchise's mix of mix of cyberpunk and fantasy genres. Microsoft acquired the video game rights to the Shadowrun series and did the unthinkable – the company turned it into a Halo-style first person shooter that ties into the 2012 Mayan Calendar debacle. To make things worse, 2007's Shadowrun lacked a single-player campaign, choosing to concentrate on multiplayer shooter experience via Xbox Live. The blend of magic and cybernetics failed to catch the eye of players, with the dedicated servers for the PC shut down in February 2008, a little over six months after release of the game. Based on Terry Pratchett's classic series, Discworld stars Rincewind, who is voiced by Monty Python's Eric Idle. Discworld succeeded in presenting a high quality story and grabbing a slew of great voice actors. Discworld falters due to a high difficultly level and extremely difficult controls necessitating the use of a mouse and squinting your eyes in the PlayStation version. Easily the "best worst" game on the list, Discworld could have been a generation defining game if developer Psygnosis spent a little more time tweaking the title. Not so much a bad game, but a casualty of ambition. X-Men: Ravages of Apocalypse originally began as a fan-created mod for Quake, X-Men: Quake. The first-person shooter makes the player a minion of Magneto and pits him or her against clones of the X-Men created by Apocalypse. In time, Zero Gravity Games sought licensing from Marvel in 1997 to sell an amped up version of the game, X-Men: Ravages of Apocalypse. Marvel gave the small developer a December deadline for release, leading to a flawed, artificially difficult game where robot clones of Joe Madureira-era Psylocke, Wolverine, and Rogue (with really polygonal bad hair) attack the player in unending waves. Based on one of the greatest characters from the UK comic 2000AD, this 2009 port of a 2006 PS2 game with a much shorter name. The game unfortunately suffers from complicated controls involving Nintendo's WiiMote and Nunchuck along with drab graphics; graphics that particularly suffer in the move from the Playstation 2 to the Wii. The game does do a good job of integrating key parts of the comic series, like the use of biochip technology to keep Rogue's dead buddies Gunnar, Bagman, and Helm with him at all time, but this isn't enough to make the game a winner. If you do come across the game, you are not totally out of luck, as the Wii edition is rather rare. Based on the 1992 movie that is not really, but sort of based on a Stephen King story that appeared in Night Shift, Lawnmower Man is an interesting property to adapt into a video game in the early 1990s, a time when kids still dominated the game-playing audience. In an fantastic case of franchise shoehorning, game developer THQ took the storyline of the movie and turned it into a side-scrolling shooting game similar to Contra. The PC version is a completely different game, holding closer to the storyline of the movie and featuring some interesting visuals during the virtual reality sections. I was "that guy" who pre-ordered Masters of Teras Kasi and picked it up opening night. A fighting game for the PlayStation in the style of Tekken, Star Wars: Masters of Teras Kasi sounds like a dream. Boba Fett versus Chewbacca fighting in a squared circle? Hell yes! MoTK introduced Arden Lyn, an assassin and Teras Kasi expert who gathers Luke, Leia, Han, and more for a martial arts tournament. This is where I should have pulled out. While ambitious in concept, Star Wars: Masters of Teras Kasi failed in execution thanks to unbalanced characters. Want to see Han Solo fist fight a lightsaber wielding Darth Vader? No, no, no – this should never happen. I don't want Han to die. But thanks to lightsabers being as dangerous as wiffle ball bats, this forbidden battle can happen in Masters of Teras Kasi. 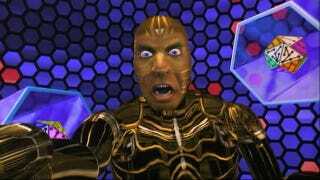 Top image is a screen cap from the movie The Lawnmower Man by New Line Cinema.